My daughter is doing a school project on WIREs also (Wildlife Information, Rescue and Education Service) so we are currently knitting possum and marsupial pouches. I’ve also made a ring-tail possum drey, in the hope that if it’s good enough, it will entice the flaming big one out of living in our garage roof. (You may understand if I point out that with spring coming, it’s beginning to sound like mating season out there). 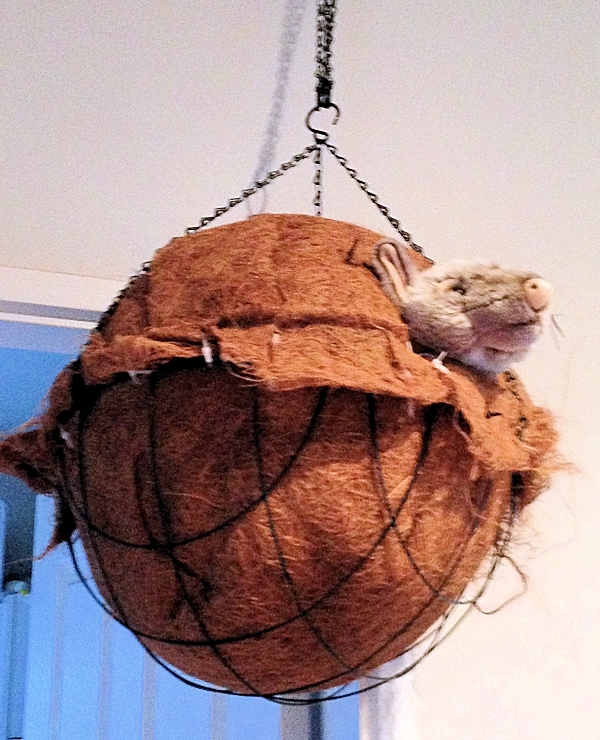 Ring-tailed Possum Drey – made from two coconut lined hanging baskets, and cable-ties. Note – this one is inside, for the purposes of photography. We typically try not to encourage our native wildlife into living inside with us, hence this is a stuffed model possum, not a real one. Yet.